Night Two of the 34th Starz Denver Film Festival was another Red Carpet Premiere, this time of Lars Von Trier's "Melancholia," screened as the Denver Film Center opening night selection. The Denver Film Center has been open one year now, but this was my first trip to the theatre; I was enormously impressed. I've always like the quaint, screening-room quality of the Starz Film Center, but the DFC is in a league of its own, with a gorgeous lobby, beautiful seating, and huge screens that outclass many of the theatre chains I frequent. I didn't get any pictures this time, but as I'll be spending a lot of time at the Center, I will in the future. For now, my review (and analysis, which involves mild spoilers) of "Melancholia" - which, to put it mildly, is the best film of 2011 I've yet seen - comes after the jump, and remember that "Melancholia" will be opening in Denver at the Landmark Mayan on November 23rd. There are many methods I use to judge movies, but the one that matters the most to me is emotional response. Film, like all art, has the power to provoke on profound levels, and when we discuss whether or not we liked a movie, we are more often than not discussing our emotions. Comedy produces laughter, thrillers create tension, and dramas run the gamut from contemplation to outrage to sorrow. When we dislike a film, we usually do so because it fails to stimulate our senses in the way it should. All discussions of cinema are born from simple, basic emotional responses; everything else just snowballs from there. So when I say Lars Von Trier’s “Melancholia” is a powerful, devastating masterpiece, the level of thought put into that praise is minimal, an instinctive response based on the potent feeling of dread, despair, and strong physical nausea that was produced as I watched the end of the world unfold on screen, a nausea that still lingers as I write these words. 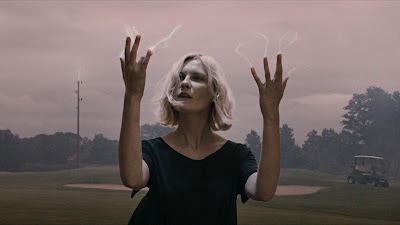 Don’t get me wrong: “Melancholia” challenged my mind and I have more thoughts on the film than I could ever hope to include in a single review, but everything that makes the film great was manifested in the emotions it instilled. Those sensations were so overwhelming that I could scarcely comprehend how I felt: was I sad, or was I exhilarated? Distraught or inspired? I’m not sure, but I am fully aware that I felt something strong, arguably stronger than any response I have ever had to a given film, and that is how I know “Melancholia” is a great movie. It provokes to the fullest extent of cinema’s capabilities and then some, transcending its medium in ways viewers will scarcely believe. The film literally begins at the end, not just of the story, but of everything: a strange, gargantuan planet is closing in on Earth. Our planet is decaying; the ground sinks beneath the feet of a fleeing mother and her son, a horse collapses under intense gravity, and a young woman watches in fascination as electricity pulses from her fingertips up towards the heavens. The planets collide, and Earth is demolished. Already, we are left breathless: these first ten minutes are so flawlessly crafted that the sequence could stand on its own as a beautiful avant-garde short, a gorgeous series of images depicting the end of our world. Each frame is a work of art, a painting brought to life, all perfectly complemented and enhanced by Wagner’s Tristan und Isolde. It is unsettling, terrifying, and glorious, as powerful a stretch of film as I have ever seen. But it’s not the best part of the movie. Mind-boggling though it may be, it is only an opening sequence designed to establish the context that the world will end. This is inevitable. The introductory images depict many of the film’s major characters, so there is no shying away from the fact that they will be at the heart of this catastrophe. This destruction is a prism through which we view the rest of the film, most of it far quieter and subtler than the opening. It is an essential use of the in-media-res technique, because Von Trier is working with some very broad and ambitious metaphors: the planet that destroys our own is called Melancholia, and as the chief representation of the film’s thematic imagery, it is right that we should be made fully aware of its cataclysmic power. After the opening, the film flashes back a few weeks to a far more joyous event: a wedding. For the bride, Justine (Kirsten Dunst), it should be the happiest day of her life. Her new husband Michael (Alexander Skarsgard) is a wonderful man, many people have come to celebrate their matrimony, and the reception is being held on her brother-in-law’s massive estate, a castle surrounded by a dazzling, sprawling golf course. But Justine isn’t happy. In fact, she is deeply disturbed and depressed, as we come to learn during what the film labels as “Part One.” The long, arduous wedding reception is chronicled in excruciating detail, and from a narrative sense, nothing really happens for at least an hour. But that’s not the point: the wedding is there to establish who Justine is, to explore and uncover her depression as she slowly but surely continues on a downward spiral throughout the night. In several scenes, she looks up into the night sky at the star Antares, shining brighter than usual; her vision is drawn there for some unknown reason. At the end of Part One, as she is fully thrust into the grip of depression, she looks up one more time. Antares is gone. Melancholia has taken its place. The metaphor isn’t hard to understand. Von Trier, who has suffered from clinical depression, uses the dual development of Justine and Melancholia to express the full, uncompromised darkness he sees in depression. Justine’s behavior grows wilder and more incomprehensible as the night goes on, and it is difficult, at times, to justify her actions. But Dunst is so good in the role and the direction so precise that we do at least understand that she is motivated by something internal. At her most open, Justine describes to her sister Claire (Charlotte Gainsbourg) the feeling of dread and fear that overwhelms her, the inescapable notion that something is coming to consume her. Having seen the world destroyed in the opening, we know what that thing is: Melancholia, both the planet and the concept. Justine’s personal depression will consume her to a point where she is as good as dead, and the planet exists not just as a physical representation of that enveloping despair, but as a vindication that what she feels is real, as palpable as an object we see every night in the sky. Von Trier’s message is clear: depression is akin to the end of the world, and he delivers that message spectacularly in Part One. As I said above, this section of the film isn’t designed to be exhilarating, but it is endlessly engaging. The reception is a world unto itself, full of characters we instantly fall in love with and get invested in, and spending an hour or more exploring this world, especially through Justine’s eyes, is enthralling. As it moves along, it becomes terrifying, for we know the terrible truth the characters don’t. As we begin to connect the dots between Justine’s depression and Melancholia’s arrival, the exhilarating horror of the opening permeates every second of this quaint wedding reception, and by the time Part One ends, I for one had already taken an emotional beating. Just as the recent film “Take Shelter” powerfully illustrated the effects of schizophrenia, “Melancholia” leant me an understanding of depression I could never have fathomed before. But Von Trier isn’t done yet. He hasn’t even started. Part Two picks up five days before the end of the world, and is now framed through Claire’s point-of-view as she attempts to care for Justine – now fully entrenched in depression – while terrified that Melancholia is going to destroy the Earth. Her husband John (Keifer Sutherland) believes what leading scientists are saying, that Melancholia will merely pass us by, but Claire isn’t quite convinced, and she grows more fearful with each passing day. Claire is the stand-in for the audience. She sympathizes with Justine, but because Claire doesn’t suffer from depression, she can’t fully comprehend her sister’s plight; I suspect most viewers will feel the same way. But Justine – the stand-in for Von Trier – wants her sister to understand depression, and Von Trier grants Justine’s wish by implementing the ultimate psychological torture on Claire: forcing her to live through the final days of Earth, stuck on a dying planet with nowhere to run. Since Claire represents the audience, we are subject to the same set of horrors; Part Two is so impeccably crafted, so precisely and devilishly paced that I forgot I was watching a movie, and was instead swept up in the fear and intensity of the situation. When Claire realizes that Melancholia is coming closer, I began to feel sick to my stomach; as Earth begins to die, that nausea grew, augmented by intense, consuming dread. As the planets collide, Claire bursts into tears, and I think I shed a few of my own before the film cut to black and I all I could hear was my own shivering breath. I was broken, unsure of what to do with myself; I didn’t want to move, didn’t even want to think. The sight of hors d’oeuvres at the after-party made me queasy. Never had a film disoriented me so, and I asked myself why Von Trier put us through this, why he felt compelled to torture Claire and the audience for the better part of forty-five minutes. I knew it was brilliant filmmaking – otherwise I wouldn’t have had such a strong reaction – but what was the thematic purpose of this section? Then I remembered Justine’s speech to Claire from Part One, where she explains what depression feels like, and I realize Justine’s words are exactly what I would use to describe watching Part Two. The purpose of this section hits me: Von Trier used film to simulate clinical depression in the minds and hearts of the audience, and by God did he pull it off. Suffice it to say, that’s an insane feat I’ve never seen a filmmaker attempt, and not only does Von Trier succeed, but he arguably redefines the outer limits of the medium in doing so. If “Melancholia” is a treatise on depression, then Part Two is essential, the component that fully allows us to understand what depression means and how it manifests itself on a level other films have never even approached. “Melancholia” isn’t an end-of-the-world drama, but a psychological study, one that uses the greatest fear imaginable to fully illuminate the thematic subject. Von Trier has many more things to say about depression and how it relates to humanity than I’ve touched upon here; in one scene, he heavily implies that evil and despair are our basic human instincts. I don’t agree with his outlook at times, but that doesn’t lessen the film’s impact. He is very clear in his stance, and he conveys that stance flawlessly. As a production, “Melancholia” excels on all levels. The cast is simply fantastic, starting with a career-redefining turn by Kirstin Dunst. She has never been as good as she is here, illustrating Justine’s depression with nuance, grace, and humanity, delivering a powerhouse performance that will linger long after one leaves the theatre. Meanwhile, Charlotte Gainsbourg taps into a level of fear and anguish so authentic that it’s impossible not to share in her apocalyptic emotions. Kiefer Sutherland basically does a menacing spin on Jack Bauer, but it’s exactly what the role needs, and I don’t think I’ll ever be able to look at him in 24 without thinking of “Melancholia.” Alexander Skarsgard, John Hurt, and many more talented performers than I can name here flesh out the wedding reception wonderfully; there simply isn’t a weak link in the cast. The film’s technical merits are extraordinary. “Melancholia” has been available through Video-on-Demand (VOD) services since October 7th, but having heard of its remarkable visuals when it debuted at Cannes, I decided to wait for a theatrical opportunity. That’s one of the best choices I’ve ever made as a film lover, because “Melancholia” embraces the big screen in a way audiences probably aren’t used to. The visuals are at their most arresting during the opening, but that’s not to say they drop off in quality from there; Von Trier primarily uses a handheld, observational technique, but it works quite well, and there’s a startling amount of gorgeous imagery throughout the film. More importantly, the film’s incredible soundscape simply has to be heard in theatres: I do not exaggerate when I say that the final scene features the most powerful use of sound I have ever heard in a movie. “Melancholia” is a film that demands to be seen in theatres, and I urge readers to hold off for its Denver release on November 23rd rather than opting for the VOD route. But whatever you do, make sure you see “Melancholia.” As I gathered from others at the festival, you may not like it: perhaps it will prove too much to handle and you won’t understand or appreciate it, or maybe you will comprehend every bit of Von Trier’s subtext and simply disagree with his central ideology so firmly that you will reject the film wholesale. But I can guarantee you will feel something, and that feeling will be immensely powerful. Reactions on those emotions will be varied, but in my book, that palpable level of provocation is what makes “Melancholia” a masterpiece for the ages and the must-see film of 2011. 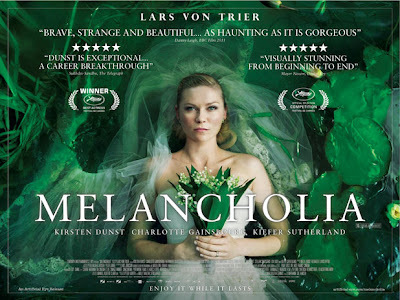 Once again, "Melancholia" will open in Denver at the Landmark Mayan theatre on November 23rd.